Coalition Chairman promises MK Eichler: If Nationality Law harms religious status quo, it'll be changed. 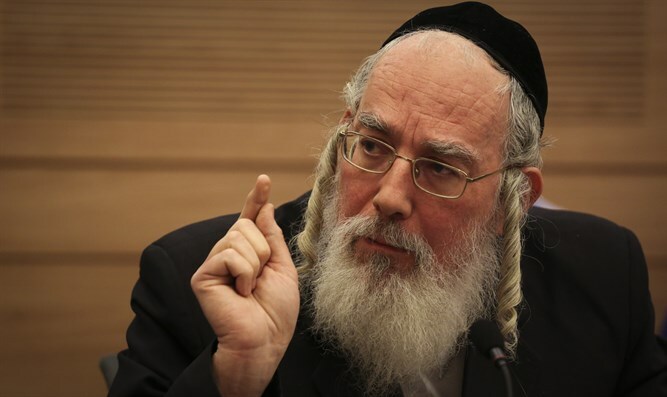 Prior to the passing of the Nationality Law on Wednesday evening, haredi MK Yisrael Eichler (UTJ) claimed the law would place the haredi community in "danger" and encouraged other haredi MKs to refuse to support it. However, Coalition Chairman David Amsalem (Likud) signed a document promising that if the Nationality Law harms the status quo, it will be changed. This promise was supported by Israeli Prime Minister Binaymin Netanyahu. As a result, MK Yisrael Eichler (UTJ) agreed to support the law. "Our nation is only a nation because of its Torah," Eichler quoted. "I am therefore happy that we stood strong and held the Prime Minister and Coalition Chairman to their promise to prevent any efforts to harm religious and state matters through interpretation of the law." "Thanks to this promise, we supported the law, with the support of our Torah sages." The Nationality Law codifies Israel’s status as the nation-state of the Jewish people into Israel’s Basic Laws and establishing the Jewish calendar as the official calendar, Jerusalem as Israel's capital city, Jewish holidays as the State's official holidays, and Hebrew as the State's sole official language while giving Arabic special standing.